On Monday, The New York Times reported that President Obama will seek sweeping laws enabling law enforcement to more easily eavesdrop on the internet. Technologies are changing, the administration argues, and modern digital systems aren’t as easy to monitor as traditional telephones. Formerly reserved for totalitarian countries, this wholesale surveillance of citizens has moved into the democratic world as well. Governments like Sweden, Canada and the United Kingdom are debating or passing laws giving their police new powers of internet surveillance, in many cases requiring communications system providers to redesign products and services they sell. More are passing data retention laws, forcing companies to retain customer data in case they might need to be investigated later. Obama isn’t the first U.S. president to seek expanded digital eavesdropping. The 1994 CALEA law required phone companies to build ways to better facilitate FBI eavesdropping into their digital phone switches. Since 2001, the National Security Agency has built substantial eavesdropping systems within the United States. India’s vaunted tech savvy is being put to the test this week as the country embarks on a daunting mission: assigning a unique 12-digit number to each of its 1.2 billion people. The project, which seeks to collect fingerprint and iris scans from all residents and store them in a massive central database of unique IDs, is considered by many specialists the most technologically and logistically complex national identification effort ever attempted. To pull it off, India has recruited tech gurus of Indian origin from around the world, including the co-founder of online photo service Snapfish and employees from Google Inc., Yahoo Inc. and Intel Corp. The country’s leaders are pinning their hopes on the program to solve development problems that have persisted despite fast economic growth. They say unique ID numbers will help ensure that government welfare spending reaches the right people, and will allow hundreds of millions of poor Indians to access services like banking for the first time. The U.S. Supreme Court said on Tuesday that it would decide whether corporations like AT&T Inc can claim personal privacy to prevent the disclosure of government records about them under the freedom of information law. The justices agreed to hear an Obama administration appeal arguing that the law’s personal privacy protections apply only to individuals, not to corporations like the telecommunications giant. A U.S. appeals court in Philadelphia handed AT&T a victory by ruling that corporations may invoke personal privacy as a legal basis for claiming that government records about them should be exempt from disclosure. The administration said it marked the first time in the 35-year-history of the law that it has been extended to corporations. Six public interest groups supported the administration’s appeal. Unless the Supreme Court overturns the ruling, government records could be withheld about coal mine safety violations, offshore oil rig problems, dirty conditions at a food manufacturing plant and questionable investment bank financial dealings, the groups said. AT&T said it has the right to make use of the Freedom of Information Act’s personal privacy exception. If there were any doubt that the 90s are back in style, witness the Obama administration’s attempt to reignite the Crypto Wars by seeking legislation that would force Internet services to redesign their networks and products to provide a centralized mechanism for decrypting user communications. The number of U.S. government requests for Google data rose 20 percent in the last six months, according to data released by the search giant Monday. U.S. government agencies sent Google 4,287 requests for data on Google users and services from Jan. 1 to June 30, 2010, an average of 23.5 a day. That’s compared to 3,287 for July 1 to Dec. 31, 2009, the company reported Tuesday in an update to its unique transparency tool. That rise is just a small part of the newest statistics on worldwide government data requests to Google, which are now paired with a comprehensive tool for viewing government blockages of Google services. The new tool lets you check timelines of traffic to 17 Google services from some 200 countries to see blockages and traffic patterns. The new tool builds upon (and replaces) the up-time monitor that Google custom-built so the public could monitor censorship of its services in China in this spring’s showdown over censorship. However, that tool inadvertantly reported a China-wide blockage in July when none existed, leading to press reports that had to be quickly retracted. Perhaps as a way to prevent spurring false-alarm news stories, the new tool will have a “tape-delay” of about 30 hours to allow Google engineers to verify and annotate outages. So for instance, if the company suspects a cable outage, not censorship (or vice versa), they can note it and prevent crying “wolf”. As for why the company would develop such a comprehensive tool? For instance, with the tool you can see the effects of Pakistan’s 10-day block of YouTube in response to a “Draw Muhammed” campaign started on Facebook that infuriated the Islamic government. Likewise, you can see the effect of China’s blockage of YouTube in March 2009. The tool does not record blocking of specific URLs or search terms, as is sometimes used in some governments’ censorship campaigns. Instead the reporting service monitors for widespread outages, though partial blocks and service degradation can be seen in the data visualizations. As for government data requests, Google added slightly more detail to its reporting on takedown requests, which now indicate how many URLs the government asked to be taken down in total, in addition to the number of requests (because a request could entail multiple URLs). In the first half of 2010, U.S. government agencies requested removals 128 times, covering 678 items. Google complied with those requests, in full or part, about 83 percent of the time. 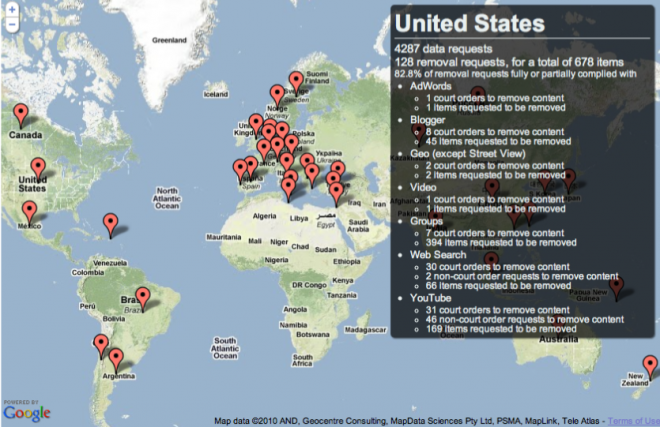 For instance (as visible in the graphic above), two courts ordered Google to remove location information from its mapping services, 45 items were requested to be removed from Blogger, and a court ordered Google to remove material from search results 30 times. Brazil remains in first place for data requests, though those numbers might be a bit unfair, because Brazilians remain heavy users of Google’s social networking service Orkut. Google debuted the government transparency tool in April, and remains the only large tech company in the United States to reveal this kind of data. Yahoo, Microsoft, Facebook, Twitter, AOL, Comcast, AT&T, Verizon and Time Warner, among others, do not publish this data, nor do they make it available when the media asks for it, even though there’s no law requiring them to keep such requests quiet. Google cannot reveal some government data requests, however, and they are not included in this tally. According to Google, the numbers do not include National Security Letters, a sort-of self-issued subpoena used by the FBI in drug and terrorism cases. At their post–Patriot Act peak, the FBI issued more than 50,000 such letters a year, nearly all with gag orders attached to them. The use of such letters dipped for a time after the Justice Department’s internal watchdog unveiled widespread abuses and sloppy procedures, but are on the rise again. Also not included are national security wiretap and data requests, known as FISA warrants, that are approved by a secret court in D.C. to combat spies and threats to national security. Nor is there any information on how much data, if any, the government forces Google to turn over en masse on individuals outside the United States, using broad powers handed to the government in 2008 by Congress. That legislation, initially opposed but later supported by Sen. Barack Obama, lets the government turn online service providers into intelligence collection arms of the U.S. government, so long as the “targets” aren’t known to be U.S. citizens. When he was a candidate, President Obama pledged to revisit that law — passed as a way to legalize much of the Bush administration’s secret, warrantless wiretapping program, but the law remains in place. Also not included are civil lawsuit requests (such as those filed in a business dispute or divorce) or copyright takedown requests, although these are types of requests generally filed by private parties, because in the United States, copyright does not apply to government-produced documents. In the world of ideas, cloud computing has the potential to revolutionize the way people work. Such cloud-based breakthroughs face a formidable obstacle in Europe, however: strict privacy laws that place rigid limits on the movement of information beyond the borders of the 27-country European Union. How we measure privacy protections? Is this data transferred to third-parties? Can the data subject see and control this data? Is this data protected by adequate security safeguards? How long is this data retained before it is either destroyed or anonymized? The last one is the least important in terms of measuring meaningful privacy protections for data. But curiously, it’s precisely this one that I hear the most as I move around Continental Europe listening to privacy media and regulatory concerns in the online debates in recent years. Why is that? European privacy law has clear provisions that personal data should not be retained “longer than necessary”. Naturally, this time period is left vague in the laws, since it would be impossible to prescribe precise time periods for myriads of different contexts, especially since retention is always justified by “legitimate purposes”. I think there’s a temptation to try to boil privacy down into something simple and numerical, and what could be simpler and more measurable than a time period? In practice, there’s a vast spectrum of legitimate retention periods, even for similar services, if the retention periods were designed to respect the very different legitimate purposes for which they were retaining data. To take some Google services as examples: Search logs (9 months), Instant Search logs (2 weeks), Suggest logs (24 hours), etc. Posted in CyberSecurity, Identity Theft, Information Security, Networking, Social Media | Tagged Cybersecurity, Google, GoSecure, Information Protection, Online Workspace, Personal Data, Secrecy, social engineering | Comments Off on How we measure privacy protections? You are currently browsing the GoSecure.com Blog blog archives for September, 2010.